County Donegal, the fourth largest county on the Island of Ireland, and its most northern county is ironically not part of Northern Ireland!. It is part of the land mass of the Republic of Ireland although its access to the rest of the country is via a narrow stretch of land to its south where it borders County Leitrim. Most of the boundary of County Donegal is with counties situated within Northern Ireland, a stroke of a pen nearly one hundred years ago could have made a huge difference. 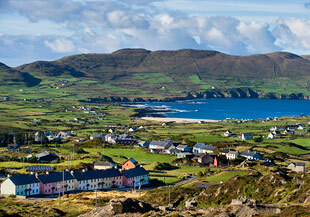 Donegal has a population of 158,000 people. 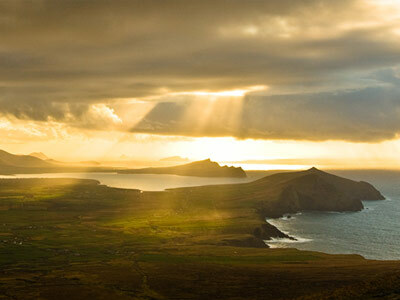 It’s coastline is part of the Wild Atlantic Way. The county is steeped in history and its people retain a very proud sense of county identity. Within Ireland, Donegal people are reputed to be very friendly and welcoming, certainly that would be the experience of this writer. Because of its proximity to the Northern Ireland border, Donegal was not on the tourist trail during that awful period we Irish refer to as ‘The Troubles’. 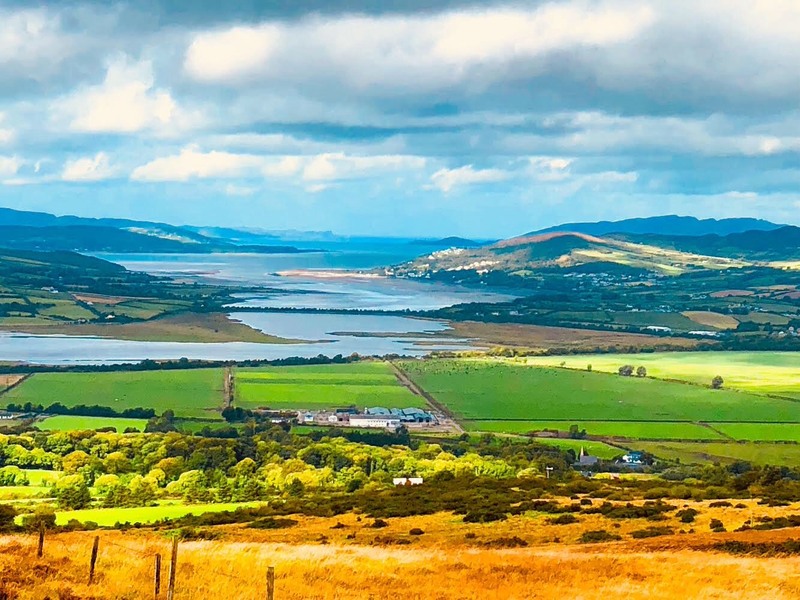 A ten minute drive from the centre of Derry/Londonderry City will have you crossing the border into County Donegal, in fact the suburbs of the maiden city have now spread across the border. Events in Northern Ireland did spill over into County Donegal from time to time, this dissuaded tourists from touring the county, it even dissuaded Irish people from ventuaring so far north. 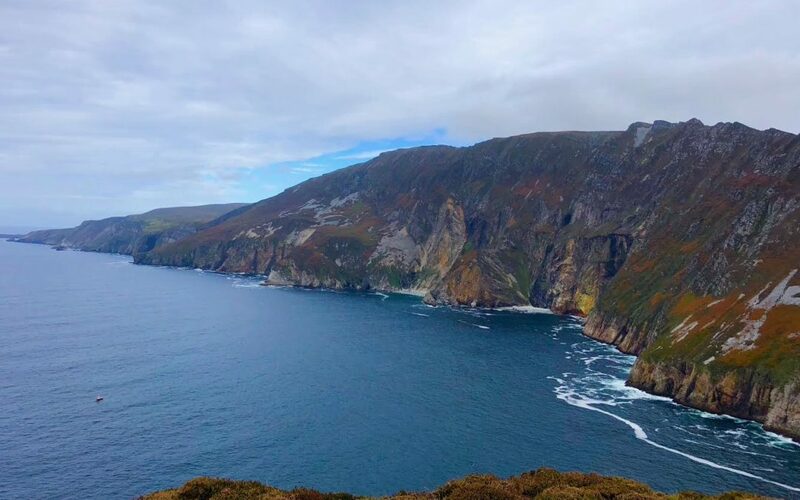 (1) Slieve League – The view at Slieve League is one of the finest views in Ireland. The combination of mountains and Atlantic coastal views is breathtaking. Access to this area is via a narrow road near the village of Teelin, you will need to open and close a gate to get access to the viewing platform but you will not be disappointed. 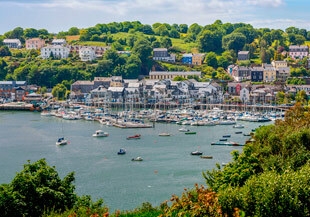 Any visitor I have ever brought to this location has raved about the views. (2) An Grianan Aileach – another location which would rank within the top ten finest scenic views in Ireland. Situated near the border, this elevated location (picture below) gives jaw dropping views of Lough Swilley, Lough Foyle and the Innishowen Peninsula. (3) Glenveigh National Park – Ireland’s second largest National Park, it covers 170 square kilometers of hillside above Glenveagh Castle which was completed in 1870. Fully open to the public and you will certainly need about 4 hours to take it all in and visit the Castle. It’s size and scenery is comparable to Muckross House and Gardens in Killarney. Well worth a visit if in County Donegal. (4) The Beaches of Donegal – without doubt no other county in Ireland has within its borders a range of magnificent beaches as are to be found in County Donegal. Stunning beaches include Rossnowlagh, Narin and Portnoo, Portsalon, Dunfanaghy and Downings to mention but a few. A drive along the Innishowen Peninsula, The Fanad Drive or along by The Rosses will reveal beach after beach set in stunning scenery. The Donegal Beaches are really special. Donegal also provides opportunities to visit locations relevant to contemporary Irish history. A half day trip to Derry/Londonderry offers a an experience of the only walled city left in Ireland. In the context of Brexit and the Irish border issue, a visit to the village of Pettigo will illustrate the impossibility of establishing a ‘hard’ border between The Republic of Ireland and the United Kingdom. 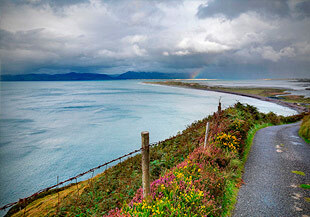 If you are planning a comprehensive tour of Ireland, Donegal is well worth being on your itinerary.